Review//Gaylord Palm Resort: Old Florida Meets Shrek! When I walked into Orlando’s Gaylord Palms Resort, I suddenly felt as though I was in a serene theme park. It was a pure mix of Old Florida and high class amenities. The Gaylord Palms Resort brings excitement to life through awesome on-site recreation and breathtakingly, sun-lit gardens under glass. The signature architectural feature is the hotel’s magnificent 4.5-acre glass-enclosed atrium. Under it, the resort recreates three Florida environments – from the moist Everglades, to the eccentric island feel of Key West. They meet in the middle to reconstruct the Spanish charm of St. Augustine. Throughout – there are live gator feedings, reptile exhibitions and more! Gaylord Palms is located only 1.5 miles from the front gate of Walt Disney World and in close proximity to other Orlando theme parks, and just 20 minutes from Orlando International airport. This luxurious hotel is home to over 1,400 stylish guest rooms, including 115 spectacular suites. Experience a 360° walkthrough now. Complimentary scheduled shuttle bus service is available from the resort to the Disney theme parks. Shuttles to SeaWorld and Universal Orlando are about $19 per person round-trip. 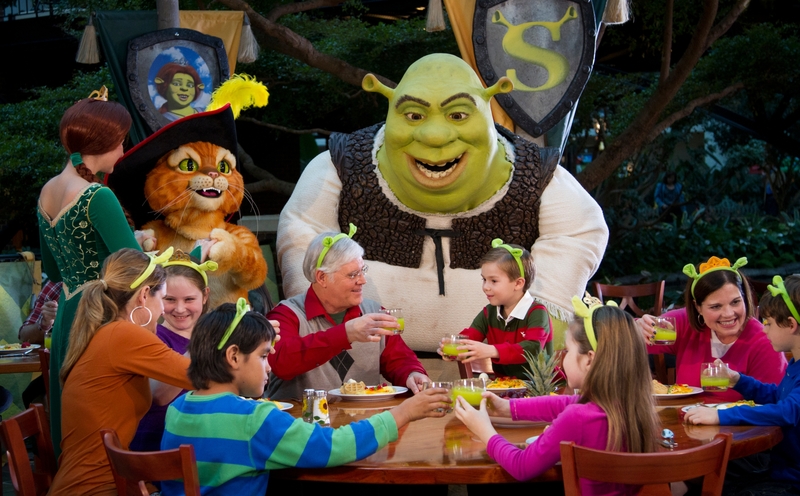 Become an honorary ogre at a scrumptious ShrekFeast. Jump into music, games and fun at the Madagascar Crack-a-lackin’ Pool Party. Enjoy DreamWorks-themed surprises for the entire family. Don’t Miss Breakfast with Shrek! Become an honorary Ogre and join Shrek and friends for a fairytale feast fit for a king! Discover a magic fountain bubbling over with intoxicating chocolate potions. Plus, Shrek and friends will visit your table for greetings and photos. Set in the grand dining room of a European Villa, the chef’s table offers a fresh and authentic seasonal buffet menu inspired by Mediterranean cuisine. *Review is based upon sample.